– What’s more precious for a cyclist-in-training, spare time or spare energy? It’s probably an even tie, which is why ‘The Feedzone Cookbook’ is so impressive. Nearly all of its recipes take fewer than 20 minutes prep time, they can be made beforehand, and they have five star flavor. Best of all, you probably can’t get better nutrition. No matter how time-strapped or exhausted you may be, you’ll never again choke down another footlong Subway BMT sub. Whether its rice cakes, chicken tikka masala, or fruit-braised pork, ‘The Feedzone Cookbook’ shows just how easy a delicious meal can be to prepare. The authors are a dynamic duo. Chef Biju Thomas strips down gourmet meals to their essence. And celebrity cycling coach Allen Lim, PhD ensures that every dish provides maximum nourishment along with providing no shortage of stories about the role of cooking, both good and bad, in the professional peloton. 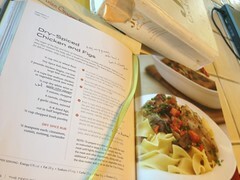 Irma Rambauer’s ‘The Joy Of Cooking’ is still the standard in any self-respecting home cook’s kitchen. Even after 75 years and nine editions, it’s full of modern and classic recipes while generally avoiding the sort of draconian prep and exotic ingredients demanded by most modern cookbooks or foodie periodicals such as Cook’s Illustrated. The one missing element in Rambauer’s book is a focus on nutritional value. There’s no shortage of frying and butter and all the other things that give great food its sinful wonder. For a bike racer, ‘The Feedzone Cookbook’ is a perfect companion volume because, like ‘The Joy Of Cooking,’ it explicitly states that half the value of delicious food is its ability to draw a table of people together. What Rambauer does through the comforting power of flavor, Thomas and Lim do the same for the bike racing crowd through flavor, supersonic preparation time, and a maniacal focus on nutrition. 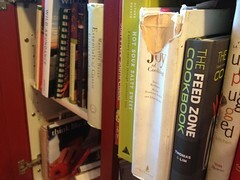 If I had to strip down my kitchen bookcase to two books, ‘The Feedzone Cookbook’ would sit alongside ‘The Joy Of Cooking.’ And best of all, it’s currently 43 percent off on Amazon.com. The savings from all the BMT footlongs you’ll never buy again will pay for it ten times over. – Like watching cult videos of bike messengers rollercoastering up and down the hills of San Francisco on track bikes, riding singletrack with a singlespeeder inspires one part pity and one part awe. Low cadence climbs and descents with a whirlwinding spin look as painful a rigid fork. But then again, pure simplicity is the zen of singlespeed. What causes most of us to wince, inspires the few to smile. The negotiated settlement between technological obsession and mechanical purity appears to be the 1×10. With only one chainring on your crankset, the real-time calculus of choosing the ideal gear vanishes. Like singlespeed, it’s pure feel with no need to complicate the experience through crosschain math about which small ring gear equals what big ring one. With a single chainring, pollution is cleared from the mind. The key to going 1×10 is choosing the right chainring. On a 29er (aren’t all of us on 29ers by now?) incredibly strong riders can get away with a 34 tooth ring. The merely fit are better served by a 32 tooth ring. With a 32, few hills are too steep to muscle over. 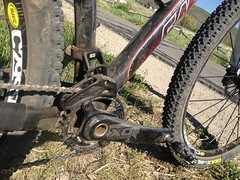 For those of us on SRAM, the conversion from 2×10 to 1×10 requires just a few items: A chainring such as those made by E Thirteen, a new SRAM spider that better accommodates the 32 tooth ring, and a chain guide (again, our preference here is for E Thirteen.) The switchover is easy enough to do in a living room, and your first ride may well be a revelation. – A piece of news that didn’t go widely reported: Did you hear that beginning in 2013 Interbike trade show will move to Las Vegas’ Mandalay Bay from its long-standing home at the Sands? Those of us who’ve spent the last decade gaming every last element of the show (the best espresso, the best meeting spot, the best quiet breakfast place, the best points of show entry/exit for crowd-avoidance) will be starting from scratch again. Newness is scary, but Mandalay Bay seems to have its upsides. I’ve previously had drinks at Red Square and dug it, I have a fondness for conspiracy theories, it’s right next to the airport, and surely its wifi is stronger than the non-existent bandwidth in the Sands. So I say bring it on. – Next on my reading queue. Can’t wait. Expect a book report soon. – Many of you are familiar with our presenting sponsorship of the Panther elite amateur road team. When they’re not busy podiuming all across America, they’re also proving that even though Competitive Cyclist now calls Utah home, the world always seems to come back to Arkansas. – A huge shout out to my great friend Craig Lewis for his stage win at last week’s Tour de Beauce. Thirteen months ago, he and his HTC-High Road teammate Marco Pinotti crashed out of the Giro d’Italia in a high-speed bone-exploding crash. Both endured long spells of immobility and surely fought against the darkest doubts. Marco showed that he was 100% back with his Milan time trial stage win at the end of this year’s Giro. And now Craig has done the same. Chapeau, Craig!